Lapel badges, rings engraved, wax seals, signage, plaques, mayoral chains, corporate gifts, tokens, key rings, paperweights, meat marking rollers, soap moulding dies, leather dies, foiling dies, cigarette printing & embossing blocks, paper embossers, steel punches, blanking tools, post office date stamps, jeweller stamps, custom prototype liquor bottles, cufflinks, pendants and money clips. Pagliari Engravers will design and manufacture awards and trophies according to your personal requirements and specifications. Our team of artists, engravers and engineers will collaborate to present you with a masterpiece created from a variety of materials – gold, silver, bronze or plated, in either a satin or polished finish or a combination thereof. The Cape Mint (Pty) Ltd. a subsidiary company of the Pagliari Group, was one of the five Mints worldwide chosen to represent Africa by manufacturing the Millennium medal in 24ct gold set with 64 diamonds.The first coin minted was presented to Pope John Paul II in Rome, by the Pagliari Group’s founding member, the late Mauro Pagliari. The Cape Mint manufactures proof quality coins for numismatic collectors and dealers worldwide. The Cape Mint also manufactures medals and awards for societies and organisations. The Cape Mint was the first mint to strike a krugerrand weighing one kilogram, 100mm in diameter. 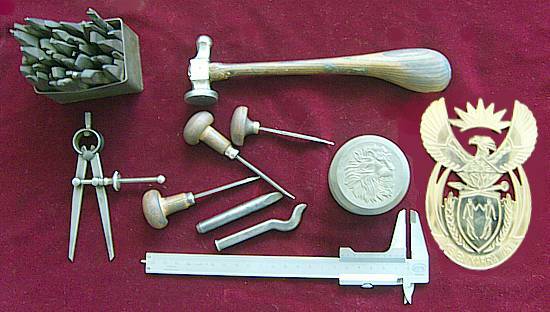 The Cape Mint has the capacity to manufacture awards and medals with customised designs. Superior craftsmanship and attention to detail are created in a metal medal of quality.